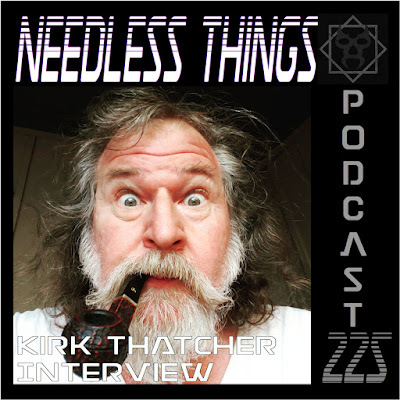 On today’s episode of the Needless Things Podcast Dave talks to writer, producer, director, and production designer Kirk Thatcher! Kirk Thatcher’s résumé reads like a pop culture wish list – from working as part of Jim Henson’s Creature Crew on Return of the Jedi to being a major part of star Trek IV to writing and directing the Muppets. He’s a man that has seemingly done it all in the entertainment business, yet who also seems like he’s just getting started. Listen in as Dave and Kirk discuss following your dreams, working hard, and getting pinched by Leonard Nimoy! NOTE: This interview will serve as the first part of a planned two interviews. The second portion is scheduled to happen live at Dragon Con 2018 for the Puppetry Track and will focus on the puppetry-related side of Kirk’s career. Look for it to be posted here on Needless Things at a later date. Copyright 2013 Phantom Troublemaker. All rights reserved.